Troo Health Turmeric Capsules provide 95% standardisation of Curcumin (475mg Curcumin per capsule). 5mg of Black Pepper Extract has been added to aid absorption of the active ingredients. Targeted release capsules ensure the curcumin reaches your bloodstream before being degraded. Research has shown that curcumin is quickly degraded by stomach acid and very little ends up in the bloodstream unless it is protected from the acid. We are so confident in the quality of Troo Health Turmeric capsules that we support them with a 100% Satisfaction Money Back Guarantee – valid even if you have opened and used the supplement! Troo Health Care Turmeric Capsules are manufactured in the UK to GMP code of practice and ISO 9001 quality assurance certification. Only the finest quality raw materials in their highest and purest form are used. These manufacturing procedures ensure that the basic manufacturing practices and prerequisites necessary for product quality and safety are being followed. This goes above and beyond what is required so that we can guarantee you receive consistently high quality products. 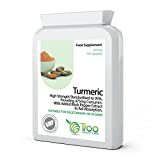 Troo Health Turmeric 500mg Capsules provide the strongest and purest Turmeric has been combined with Black Pepper Extract and carried in specifically designed targeted release capsules for improved bioavailability. The number one anti-inflammatory plant of ayurvedic medicine (Indian traditional medicine), Turmeric may help to maintain healthy joints, a healthy liver, a healthy digestive tract and a healthy circulatory system. The capsules used to carry this supplement are an innovative hypromellose (HPMC) formulation specifically designed to ensure optimal delivery for acid-sensitive products. Using plant based ingredients, our targeted release Turmeric capsules provide built in acid resistance without the need for film coatings. This ensures delayed stability of the Turmeric and improves absorption without exposure to solvents used in enteric coating. A standardisation of 95% provides optimal value as purification from 95% to 100% curcumin does not increase bioavailability, though the manufacturing costs are substantially higher. Effectively this means there is no point in having anything stronger than 95% extract. Troo Health Care Turmeric Capsules are manufactured in the UK to GMP code of practice and ISO 9001 quality assurance certification. Only the finest quality raw materials in their highest and purest form are used. These manufacturing procedures ensure that the basic manufacturing practices and prerequisites necessary for product quality and safety are being followed. This goes above and beyond what is required so that we can guarantee you receive consistently high quality products.